Note: within the first few days of my arrival in India, two people talked to me about Nick Vujicic and how inspirational he is...two people...in India. You can't see, but I'm shaking my fist in the general direction of Australia. At least I think it might be the direction of Australia. Hey, odds are 1 to 4. I love you, Nick. One of the Vujcic fans was Little Gen's landlord, who asked what had happened to my arm, then responded, "You were born that way! Praise God!!" Perhaps my work here is done. But he seemed in the habit of praising God after nearly every sentence. Not a bad idea, especially here in India where one has much to be thankful for...the fan is working, praise God, the electricity is on, praise God, there's water in the toilet, praise God. With expectations plummeting, gratitude sky-rockets. A proper play is proceeded by a list of players, and since we've recently begun a new drama, I think an introduction of some characters (pun intended) is in order. Disclaimer: this is by no means a comprehensive list, and if you are reading this as one of said characters currently in play, please do not be offended if you find yourself absent...I just put names in a hat. 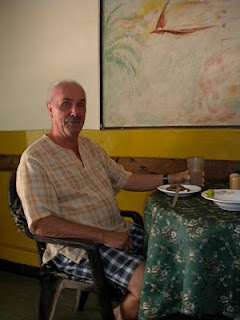 Tony is nearly the first person I met in India. Dubbed Tony Tony to differentiate from another citizen of the same name, he later "hired" me at Dinha's, thus accidentally writing much of my own role in the Benaulim dramedy. I'm not really sure what it is exactly that Tony does, or what he doesn't do, rather. He's a self-proclaimed Jack-of-All-Trades, by times driving a taxi, when he's not busy shuffling people to and fro from the hospital for various medical procedures. It is not uncommon to attempt booking an early morning swim with Tony in the sea, only for him to agree, then excuse himself with, "Oh no, I can't man, I haff ta take my cousin for an eye surr-jry," in a charming British accent acquired from years spent in the UK. 'Father Theresa' frequently shows up early mornings at Dinha's with someone's baby in tow. That is, when the leper colony can spare him. On average, I spend most of my time with Joe [center]. This happens accidentally because, aside from Pascal, he is the longest-standing faithful employee at Dinha's. Unless it's the Wednesday after Tuesday night at Pedro's, when he's been known not to show up at work at all. He can't, of course, because he needs the sleep. I love India. I think Joe also took most of the photos in this post since he was 'volunteered' to be my personal photographer. After my second day on the job this season, Joe fired me. So I took the rest of the day off as usual and returned the next. Turns out, it's legally very difficult to fire an unpaid employee. So now, every other day or so, one of us tries to fire the other, and I think Pascal is just grateful there's ever any one there to serve at all. When I allude to his job as the manager of this monkey train, he says, "I am not the boss. I don't tell anyone what to do." I may have found the only existing successful establishment without management. Where is Neitzsche now? Mikey Man [lower right above], previously mentioned elsewhere in this blog, belongs entirely to Goa scenes in my story, though he's actually some strange mutation of Los Angeles and Maine. But you know how I feel about mutations, and Mikey is one of the best. He's one of the few foreigners with an actual job, restoring and coloring film, architecture, and my life (sorry, Mikey, had to do it). When we're feeling lost and alone and just in the mood for a good burger, we Americans cling together. Mikey may also be the only person of non-British origin I've met who rivals the command of wit found in that isle. Wordplay is his martial art, sentences bending unwittingly to his will; without my coffee, I haven't a fighting chance. Yet, a kinder person is hard to find, and a wit with heart, an endangered species. You might expect a character only appearing in several scenes excepted from this list, but Laughing Jean is of such exceptional note, she is here included. Only in Benaulim for a short holiday, she did not fail to make an impression with her late night appearances at Pedro's beach shack. On the dance floor, she was Grandma Dancing Queen; carnival lighted glasses on, she was un-bested at the shake, the twist, and several moves of which I'm not sure of the origin, but bear a striking resemblance to cossack choreography. And then there's the laugh, oh the laugh...suddenly sitting straight-backed, she "bah, ha ha ha haas" like a sitcom laugh-track machine gun. Helmut is a man of few words. If I were really German and not merely wannabe, I imagine he and wife Annalee would be my grandparents. Influential in the beginnings of Dinha's, they arrive without fail in the wee morning hours for fruit salad and black coffee, two. Then it's Egg Day or Cheese Day, depending on...what, I'm not sure...but if they were to show up one morning and order a Spanish omelette, I'd expect The End of Days just around the corner. Though he's rarely eating alone at any of the three meals he has at Dinha's, I never fail to catch his observant eye, shamelessly interested in what's happening outside the circular table. One minute behind the eyes would be worth at least 50,000 rupees, I'm sure. When I asked to take their picture, Annalee declined, but Helmut said, "Take a picture? Yes, why not?" in a gruff, yet startling playfulness. I nearly dropped my camera. Marcelle and Michael, my favorite local hippies and long-time visiting Goa ex-pats, create the bohemian Swiss and German triad with me on the third floor at Savio's Guesthouse. Though, actually, in their company, I hardly qualify on any of those points. Sometimes I imagine what happened in their lives before this, and other times, we just have a smoke and watch what comes and goes from the balcony. Roxy, most permanent resident at Dinha's, takes the rays.